Those in the picture is wooden big chess pieces, the King, the Queen, the Bishop, the Knight, the Rook, and Pawn. The big chess pieces are made from Teak wood, the strongest wood in the world with very best quality of wood and has dried. Very durable for outdoor use and if you enough space in your house, you can play the big chess in your house with children and other family member. Big chess sets sometimes use as house accessories to make your house more interesting and decorative. You can put it in your living room, dinning room, children room or you may put it in your patio area. 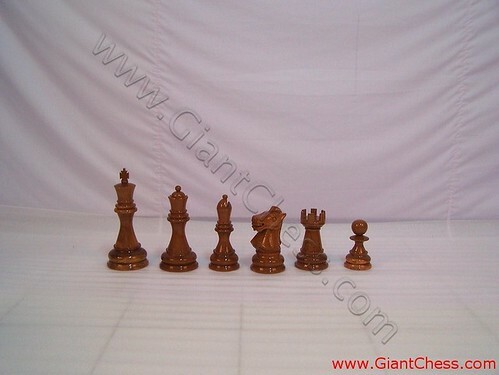 In the picture is an example of our big chess set that polished in brown or natural wood color. We have another wood chess pieces in variety sizes and colors, such as chess set in 12 inch, 24 inch, 32 inch, 48 inch, 72 inch and more. Beside that, we also have chess set in black, blue, green, white, purple and many more. Choose your favorite one and order it to us!